Who is Ali? Ali is a 62 year-old recognized refugee from Pakistan in Hong Kong since January 2010. He spent several winters freezing in a container abandoned in a Kam Tin recycling yard. In the summer his home became unbearably hot. Before rental deposits were introduced for refugees, Ali accepted such limited hospitality from residents offering temporary shelter. 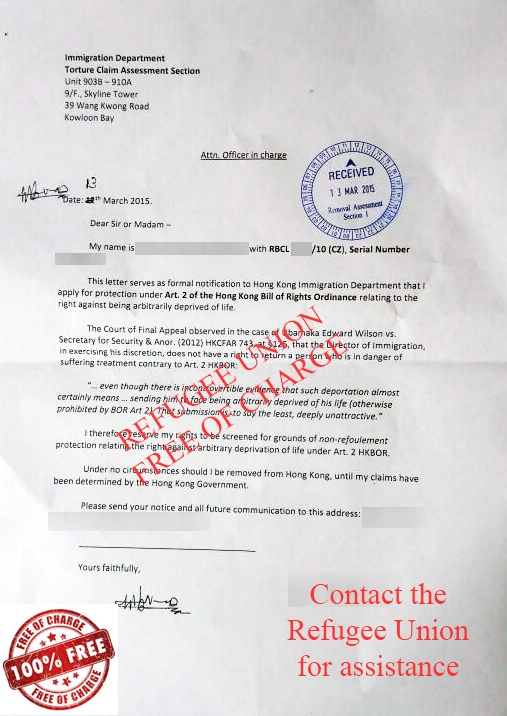 By living in a possible illegal work place, the Pakistani defied the common assumption that his countrymen abused asylum to work in Hong Kong. For five years, Vision First followed closely Ali’s asylum experiences in our inhospitable city. Conspiracists might be forgiven for speculating about the baffling backpedaling by UNHCR which unexpectedly confirmed his status as a refugee on 29 April 2014. It might not be a coincidence that Ali’s lawyers had reversed the Legal Aid decision and prepared a well-document, arguable case that might have forced Immigration to reconsider its decision. Ali suspects that the government put pressure on UNHCR to resolve his claim and stop legal proceedings. At the time he was hospitalized, Ali was informed that since his condition had not reached a ‘life threatening state’, the hospital could not proceed with free surgery and he would have to pay for the stent himself. Five years in limbo without the right to work dilapidated Ali personal resources. Today he is truly destitute. ISS-HK referred him to SWD which unempathically stated that they would not pay until his condition deteriorated. Let’s face it. Ali has been treated poorly from the day he arrived and was reduced to living in a shipping container for years. His family was displaced and fell from relative prosperity to grim poverty. Now Ali spends the days bedridden in a room that appears to be an illegal structure. He is afraid his heart will fail overnight. He hardly dares to walk outside for fear of collapsing in the street, which ironically might be the only chance he has to receive the necessary surgery. Hospitals, ISS-HK and SWD kick away responsibility like a ball. Is it reasonable to ask a sick refugee to raise money himself to save his life despite being granted international protection? What meaning does the status of refugee carry for UNHCR, ISS-HK, SWD and the government? Who will be held accountable in a worst case scenario for such absurd conditions of institutional punitive confinement? Hong Kong should step up and honor Ali’s protection with the peace of mind and wellbeing it ought to entail. Very few lawyers stand apart for attaching the utmost importance to refugee rights and striving to ensure such rights are respected and safeguarded in the interest of the asylum community and the city’s reputation. The reality is that in most cases they have to represent clients pro bono. In February 2014, barrister Robert Tibbo obtained leave to make an application for the judicial review of the torture claim of a South Asian woman whose appeal was dismissed without an oral hearing. Her council, a non-executive director of Vision First, argued that various factual matters relevant to the case had not been addressed by the adjudicator who cherry-picked country of origin information. The woman sought refuge in Hong Kong in 2005 to escape from threats to her life and safety due to her political activities and the serious abuse she received from her husband affiliated to an opposing political party. As if her struggle for protection was not enough, a decade later she stood before the bench in Eastern Magistracy to answer to charges of working illegally. In 2013, the woman was arrested by police at the back of a restaurant where she occasionally washed dishes for exploitative wages. 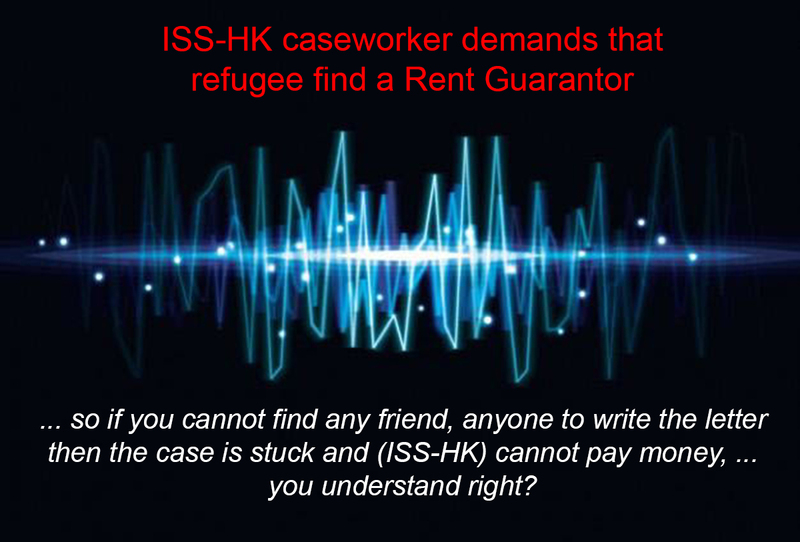 For months she had paid cash for a dilapidated subdivided room, because the landlord refused to accept bank transfers from ISS-HK and she was unable to find alternative accommodation within the paltry rental budget that was then 1200 HK$. It is not uncommon for refugees to rent the cheapest rooms from landlords who prefer cash payments to reporting bank transaction in income statements. In such cases tenants are obliged to secure cash somehow, or risk being homeless. Under the circumstances, the great majority of refugees seek employment in the informal economy and risk arrest, prosecution and jail for attempting to make ends meet. 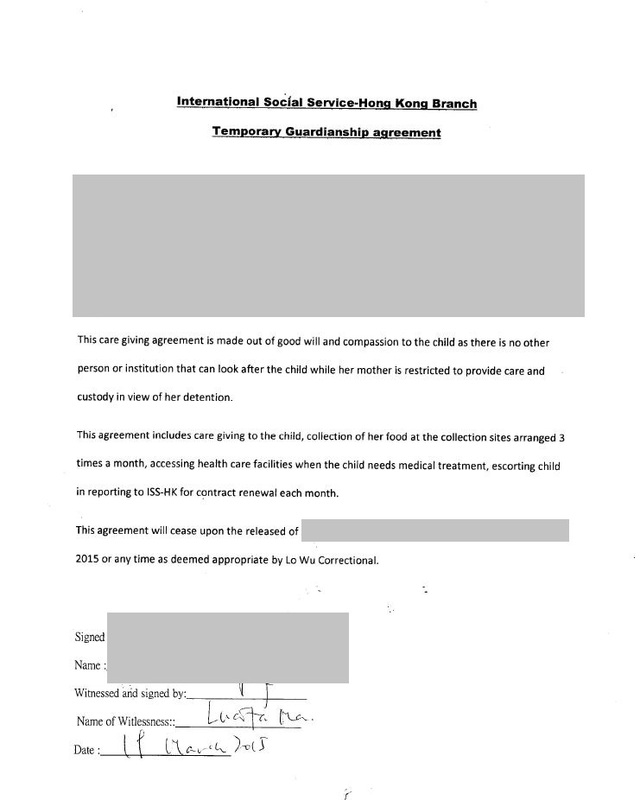 Interestingly this woman’s situation ticks several failures in the current asylum policy: 1) denial of protection; 2) prolonged determination of claims; 3) prohibition from working, and 4) insufficient welfare assistance, which in this case included failure by ISS-HK to secure suitable accommodation for a vulnerable woman. Robert Tibbo is seeking a stay of prosecution arguing that systemic failures placed his client in a predicament in which she worked to avoid sleeping in the street. At a hearing in April 2015, the magistrate suggested that a judicial review be sought against the Director of Immigration who sets the recognizance conditions, including the prohibition from taking up employment. The argument is that if the government openly met the basic needs of refugees and signed tenancy agreements, then refugees would not be compelled to work illegally. Did child services fail Precious? Is it right for a government contractor, financed by hundreds of millions of dollars from the Social Welfare Department, to transfer a 3 year-old child into the care of a destitute refugee woman without adequate support? What if the woman met the girl only a few days earlier? Several months ago Vision First raised a complaint with SWD about a little girl who showed up at our office unwanted by the refugee carers who were stuck with her after the mother was jailed for 18 months for working illegally, possibly to raise a daughter in this expensive city. Presumably the SWD has operating procedures for its child services department tasks to provide assistance for young children whose parents are incarcerated and who, after the age of 3, are no longer allowed to stay in prison with a parent. This is what happened to Precious. Two refugee friends of the incarcerated mother anxiously sought our assistance and we raised our concerns with the SWD, as we didn’t have resources to care for children, particularly of such a young age without parents. 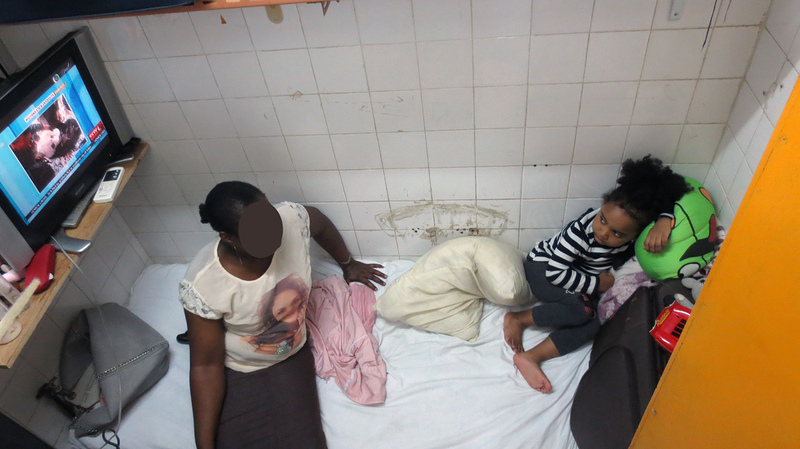 The women complained that ISS-HK had entrusted them with Precious without providing adequate assistance to look after and care for her day and night. The agreement fails to mention the countless tasks a parent performs in child-care: cooking, cleaning, bathing, clothing, playing, talking, teaching, putting to bed … and generally paying full attention to the wellbeing and happiness of children. Any parent will agree that caring for children is a never-ending obligation typically performed at great personal sacrifice. Why was Precious entrusted to a refugee women she had never met before? Assuming the women is wonderful (she is), is it right for a child to live in a tiny partitioned room without ventilation, kitchen, bathroom or even a functioning TV? Is the women expected to cook, bath and cloth and share a single bed with a little girl who is not her daughter? Is she expected to provide motherly care as a destitute refugee without financial assistance? How can the women travel on her daily routine without even a child Octopus card? Would this be an acceptable treatment for resident children in the care of SWD? Vision First is alarmed at news from detainees in Castle Peak Bay Immigration Centre, Tuen Mun (CIC). It is reported that the Director of Immigration may have failed to respect the importance placed on the non-derogable and absolute “Right to Life”, as enshrined in the Hong Kong Bill of Rights Ordinance that is binding on all government authorities. 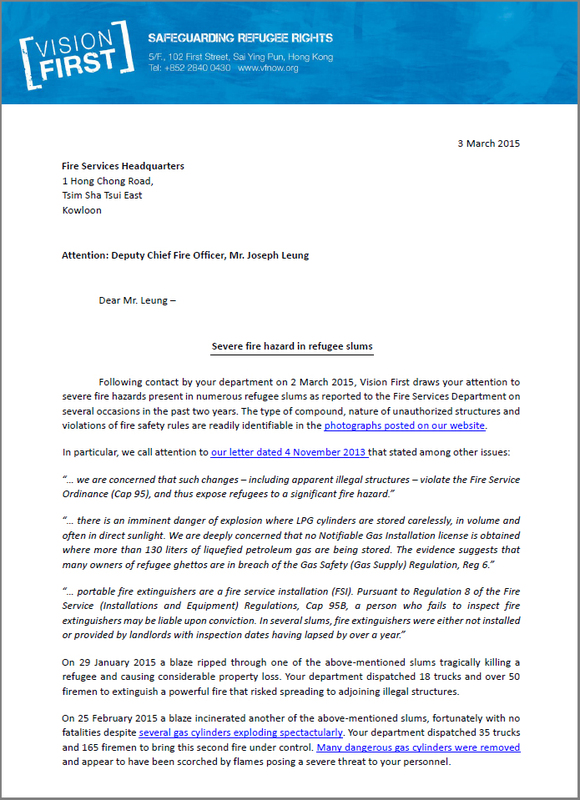 On 23 March 2015, Vision First wrote an open letter to the Director of Immigration, inquiring among other issues about particulars of the training of officers charged with processing “Right to Life” claims. 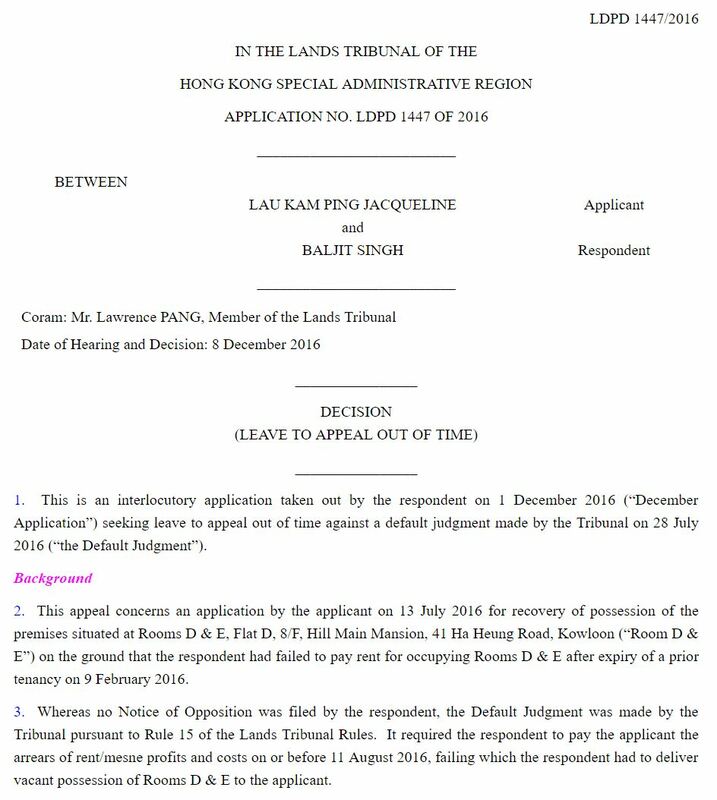 The Court of Final Appeal held that the right to freedom from being arbitrarily deprived of life also applied to persons not having the right to be in Hong Kong, including refugees. The right not to be arbitrarily deprived of life (i.e. extra-judicially killed) is fundamental and absolute. It is a universal human right that cannot be limited, suspended or restricted for any reason, by any person. They says that if they send letters to anyone those letters are not going out from CIC. Several refugees confirmed this information. The Director of Immigration may be acting unlawfully in the execution of removal and deportation orders that ought to be stayed when detainees file “Right to Life” claims? These allegations only deteriorate the already precarious reputation of the Hong Kong Government in the field of human rights, suggesting an ostensible turn towards uncompromising obstinacy that certainly stands at odds with the city’s self-proclaimed liberal and welcoming urban lifestyle. 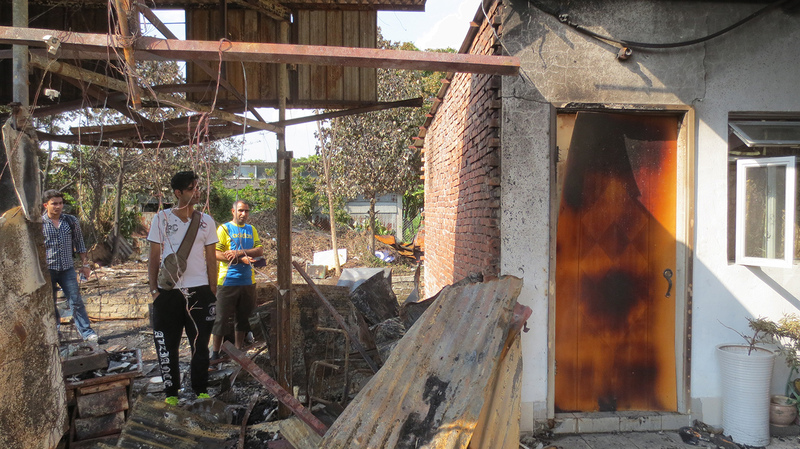 The village of Ha Che (下輋) is located in the rural area of Pat Heung (八鄉) where a slum fire took the life of a Srilankan refugee on 25 January 2015. Vision First campaigned for two years against refugee slums and exposed the dangerous, unhygienic conditions refugees are forced to endure without assistance or resources to rent basic, functional and safe housing. Truth is, the results we achieved prior to the two slum fires were debatable. The SWD contractor ISS-HK only closed down the worst compounds, while slum lords got busy improving access, structures and facilities in dozens of other ghettos that remained unchallenged, despite being in gross violation of countless rules and regulations. Slum refurbishment and improvement was the new strategy. It didn’t seem to matter that tin sheds and wooden huts were unauthorized structures that failed to meet building, hygiene and safety standards. 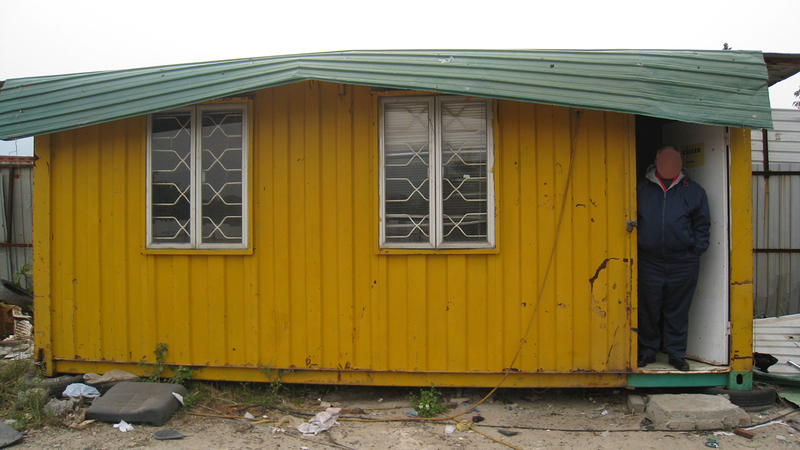 Provided rooms had four walls and a false ceilings, ramshackle structures were good enough to settle refugees. A case in point was the development of an area in “The slum in three sheds” reported by Vision First on 12 June 2014. A scrap yard around a small and dilapidated ancestral house was constructed into a large slum after our visit. ISS-HK approved this location for refugees in September 2014 according to the local fixer who proudly showed us around the business he was hopping to grow. The fixer is upset with ISS-HK and feels unjustly treated. The fact that he erected illegal structures without permits escapes him. Water splashes inside the container when he flushes the primitive contraptions offered as toilet-shower to demonstrate that water flushes human waste into the field. The mobile kitchens are so rudimentary refugees don’t use them. It appears that the fixer entered the slum business too late. He explained that the shed with 12 rooms rented to ISS-HK in September 2014, while the one with 8 rooms was operational in October. He gave us a tour kicking metal sheet to prove stability. “There were many refugees living her, but they left after ISS stopped paying rent” he laments. 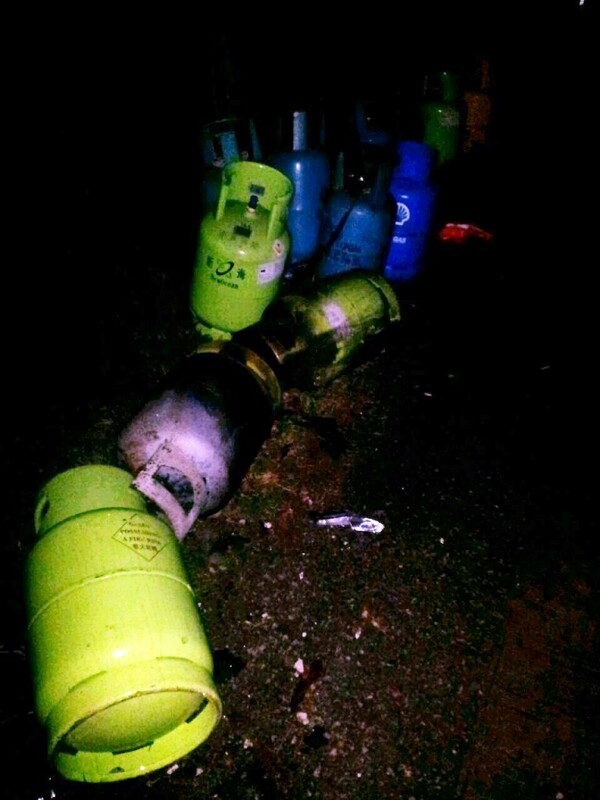 On the night of 25 February 2015, a dozen gas cylinders were removed by firefighters from “The slum with rusty gate” to prevent further explosions. Prior to the arrival of fire services, witnesses report hearing five large explosions presumably from other cylinders caught in the blaze. On 11 February 2015, the Lands Department affixed this notice at the Slum on Two Storey, the site of the fatal fire. The registered owner is notified that three metal and wood structures of specific measurements had been tolerated. However such structures had been previously demolished and replaced with the current unauthorized structures, thus cancelling the squatter license. In other words, the entire compound is found to be illegal and must be returned to agricultural use. A quintessential expression captures the moment – closing the stable doors after the horses have bolted. Since May 2013 Vision First has advocated tirelessly for safe and proper housing for slum refugees by reporting our findings to departments including the land authority. Two weeks after the death of a refugee squatter, lease enforcement commenced against an unscrupulous slum lord. It appears that not all government departments are reading from the same page. On the one hand Lands Department publicly stated that several refugee slums are illegal and posted notices at certain location. On the other, the Social Welfare Department did not concede that rules and regulations were broken by settling refugees in slums since 2006. Truth would go a long way in resolving the issue. Meanwhile the Hong Kong Police is apparently attempting to maintain order in a familiar way, namely gagging refugees from voicing grievances. Whether coordinated or the result of individual opinion, a Refugee Union leader affirms he was visited by four police officers in his tin shed at night and warned that he should not join an upcoming protest. Another refugee in a different slum was told by a policeman, “Why you complain? You have a good room”. The officers were met with silence as pajamas were not the right attire for a debate. At this juncture, the government should be coordinating and implementing a rational clearance of dangerous slums. Priority should be given to locations with high fire hazard from which refugees ought to be urgently moved to guesthouses while permanent solutions are identified. It is meaningless for caseworkers to instruct refugees to immediately secure proper accommodation for 1500$ a month! Refugees were victimized when they were first settled in slums years ago. Today they are victimizes again by sudden evictions. It is a no-brainer that 1500$ legal rooms do not exist and refugees have no resources to pay for rent surplus, since they are not allowed to work. Something is amiss in the government’s strategy to resolving this housing crisis in which everyone is responsible, and not only the refugees as pro-government propaganda states. The above mentioned paper concludes, “It is the Government’s policy that no one would be rendered homeless as a result of the clearance programmes. When clearance is to be conducted in a squatter area, all persons … will be rehoused to public rental housing or interim housing units according to their eligibility.” Current practices again shamefully belittle the dignity and humanity of refugees. 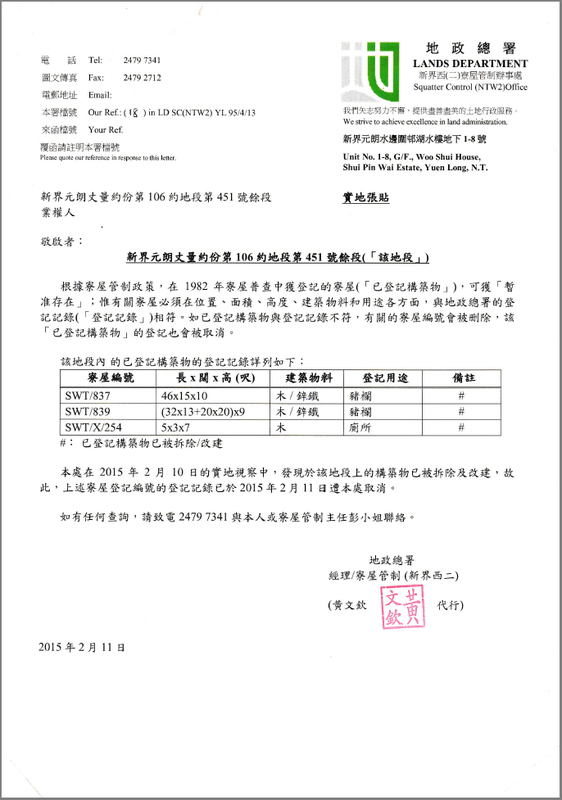 Vision First reports with great consternation that, between August 2013 and January 2015, the Social Welfare Department’s (SWD) contractor and agent, International Social Service (ISS-HK), increased collaboration with the flagrantly exploitative and reckless landlord of lot 451 (Demarcation District 106). It appears to us that ISS-HK is fond of the false justification, which has been consequentially echoed in the media, that refugees choose to live in slums or ghettos and refuse to relocate to better accommodation because they prefer to live with their friends. This position needs to be carefully analyzed. On 19 May 2013, the news of the existence of refugee slums in Hong Kong broke with the South China Morning Post article “Bangladeshi refugees’ unliveable conditions appalls activists”. It will soon be two years since then, over which time the Hong Kong authorities have done little or nothing to clamp down on what apparently amounts to a joint enterprise, between disburser (SWD and ISS-HK) and the landlords recipient of taxpayer money, to direct and settle refugees in openly dangerous and life-threatening agriculture and industrial infrastructures, in flagrant disregard and breach of the laws, rules and regulations governing zoning, authorized structures and fire safety. Reliable evidence will be presented in due course to the relevant government departments to expose a business model that developed, prospered and self-reinforced, whereby the government and its agents allowed profit-generating income streams for slum lords, by way of exploiting the use of unauthorized structures erected to facilitate caseworkers’ task to settle homeless refugees with no negotiating power when ISS-HK imposed unrealistic and unreasonable rental budget limits. Vision First contends that any person who has participated in the settling of refugees in slums up to and including the present day, should have known or have constructive knowledge of the dangerous conditions that have resulted in accidents and a recent fatality. Joint enterprise or conspiracy is where one or more persons immediately cause the actus reus of an offense, while others participate in it with the agreement to reach a specific objective, in this case the marginalization of refugees in slums. If the joint enterprise or conspiracy is to settle refugees in slums, then it matters not which person in the conspiracy and/or joint enterprise is a SWD or ISS-HK caseworker, a real estate agent, a caretaker, a middleman or a registered owner of the slum. All parties involved are culpable. The continued activities of SWD, ISS-HK, real estate agents, landlords and respective agents amounts to what is arguably continued criminality, while the government’s failure to carry out its legal duties can amount to misfeasance or malfeasance of public officials. 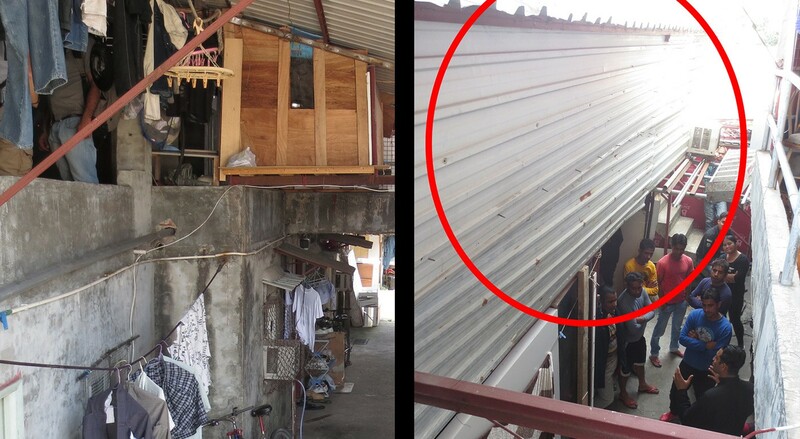 The following photos display the dangerous unauthorized structures erected between 2013 and 2015 by a landlord hellbent on profiting from rent paid by ISS-HK. It should be noted that all the refugees interviewed in this compound were on Immigration recognizance and registered service users of ISS-HK, who disbursed monthly rent assistance to this landlord (estimated at over 600,000$ yearly) presumably after carrying out due diligence with regard to accommodation and documentation.